COLONEL THOMAS TO NEW YORK CONVENTION. SIR: Yesterday was brought before me Joshua Ferris, whom I send by the bearer, and whose examination is enclosed. He is an old offender, has been sought for long since by the Committee of this County to answer for his repeated offences, particularly in being in arms against this country. He was also suspected of being guilty of spiking up our cannon near the bridge. I therefore refer him to the honourable Convention of this State for trial. To the Hon˙ Nathaniel Woodhull, Esq˙, President of the Convention of the State of New York, at Harlem. P˙ S˙ Philip Scureman and Frederick Secore, who came on shore with the prisoner, having then made their escape, were immediately pursued by Captain J˙ Vermilyea’ s company of the Militia, who apprehended the prisoner. Joshua Ferris, being examined, says, That on Friday, the 26th July, he went on board the Phenix in the night, and returned on shore the next day, and after staying on shore till the Wednesday following, then returned on board the said ship; that he saw one Bailey on board the said ship; that he saw two persons on board the ship who came from New York, while he was on shore, one of them with a laced hat and one eye, but does not know their names. Philip Scureman and Frederick Secore went on board the ship and returned with him. That he also saw Lewis Purdy, of Croton, on board. That when the ship was aground, she ran about one-half of her lower-deck guns forward to lighten her. 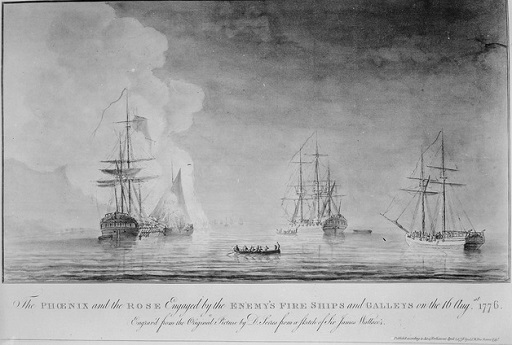 That he was on board at the time of the engagement, and understood there was one man killed and two wounded on board the Rose, but there were none hurt on board the Phenix. Joshua Ferris, son of Caleb Ferris, being this 7th day of August, 1776, examined, saith, That he went on board of the Phenix last Friday week, (being the 26th day of July last,) and returned on shore the next day; that after having staid on shore until the Wednesday after, he returned on board again in the canoe, he put off in from Benjamin Lefigy’ s; that he saw on board of the Phenix one Bailey, Philip Scureman, and Frederick Secore, both of whom came on shore with this examinant last evening; that he saw also on board one Lewis Purdy, from Croton River. That he was on board when the ships were attacked last Saturday by our galleys, when, as he was informed, one man was killed and two wounded on board of the Rose. That your petitioner was inlisted in his Majesty’ s service the fifteenth of April last, and received his bounty money in the said service, not having the least suspicion of an alteration of the form of Government, and as your petitioner, on coming on shore, was apprehended and immediately loaded with irons, in which state he hath continued almost ever since, and as he humbly conceives himself to be under the limitation of a prisoner of war, he begs of this honourable House that his irons may be taken off, as he cannot possibly shift himself, or get clear of the vermin with which he is greatly infested, to the great disturbance of his unfortunate fellow-prisoners; and he further relies on your Honours’ well-known humanity to treat him as an unfortunate prisoner of war, and allow him the same liberty as other prisoners belonging to his Majesty, as your petitioner declares that he will not interfere in any matters concerning the present unhappy troubles, but behave himself as becomes a faithful prisoner of war. Your petitioner therefore humbly submits his case to your Honours, and begs for such relief as to your Honours shall seem meet. And your petitioner, as in duty bound, shall ever pray.